MOSCOW. 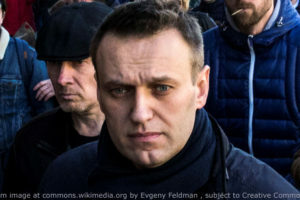 Feb 6 (Interfax) – The Russian Investigative Committee on Tuesday questioned the opposition politician Alexei Navalny in connection with injury caused to police officers during an unauthorized rally on January 28. “Today I was questioned by the Investigative Committee which explained to me what it was probing. I was shown a police report which contained this ridiculous phrase, literally: ‘Alexei Navalny, when being apprehended, kicked me with his left leg in my right leg near the knee, causing me an acute pain.’ And this claim by a policeman became grounds for an Investigative Committee inquiry,” Navalny said on his youtube channel. The report was accompanied by a video that he had posted on Instagram earlier, Navalny said. “A medical examination is due to be carried out. And the inquiry has been launched under Article 318, i.e. use of violence against a representative of the authorities,” Navalny said. Earlier a spokeswoman for the Investigative Committee’s Moscow office, Yulia Ivanova, confirmed that Navalny had been summoned for clarification of an incident in which police officers were injured during a mass rally on January 28.